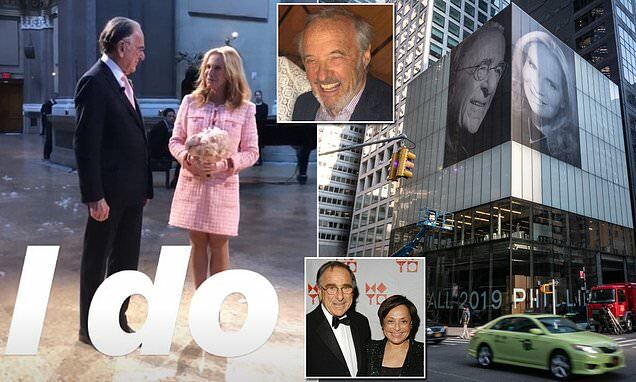 Billionaire Harry Macklowe has married Patricia Landeau on Thursday in Brooklyn, after erecting a a 42-foot-tall message to everyone in Manhattan, which includes his ex wife, Linda Macklowe, that he's in love with a new woman and he got to keep the condo. Harry, 82, installed portraits of himself and Patricia on the side of the building at 432 Park Avenue, which includes a floor of luxury living space that was hotly contested in his split with Linda. In the end, Harry got to keep the multi-unit located on the 78th floor at the corner of Park Avenue and East 56th Street and is now decorating it the building as he sees fit. Patricia's ex-husband Marc Landeau gave her away at the ceremony Harry and Patricia will have their reception in the space where the massive photo is featured on Thursday night, less than three months after the property settlement was reached. Linda, 80, filed for divorce in 2016, after learning that Harry had been putting Patricia, who is in her early 60s, up for at least two years in another property, not far from the conspicuous display. Patricia wore a long-sleeve pink number by Chanel for the ceremony on Thursday,at Brooklyn's Weylin, which is an event venue located inside the former Williamsburgh Savings Bank, in a ceremony officiated by presiding New York Supreme Court Justice Alan Scheinkman. Video captured of the intimate event by Talitha Landeau and shared to social media showed Harry in a matching pink tie, with a crisp, white dress shirt and black suit.